After it hit 109 on the mercury this week, I was dreading the weekend inspection, but we had a small respite today with a possibility of some much needed rain. Rosemary is trucking along, and I may need to add a 5th super this week. She is slowly but surely building up her honey stores, and I am very curious of what this honey from the community garden will taste like. It looks much darker than the recent South Austin harvest perhaps from all the sunflowers in the area. 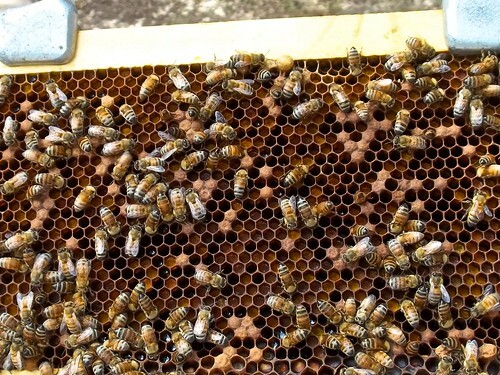 If I am able to take some honey from this hive, I think a pollen analysis is definitely in order. 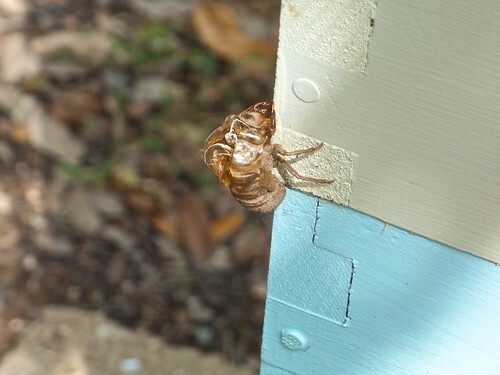 She is also still laying tight brood patterns and is still a very gentle hive. Before heading over to Baab-Brock Farms, we stopped by the Dai Due booth at the Austin Farmer’s Market. I’m a big fan of anything Jesse prepares especially since he sources everything he can locally. I traded 2 gallons of the recent spring honey harvest for some of his delicious Venison/Pork Hot Dogs. You may see my honey in one of his breakfast creations at his stand so stayed tuned for updates. The inspection at Baab-Brock Farms was straight forward. Both hives are doing well and still have a lot of honey packed away. 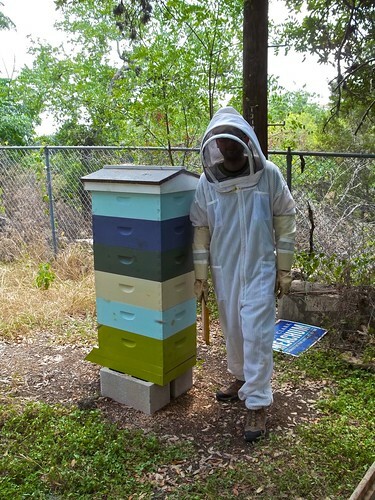 I tend to be conservative when it comes to harvesting honey because you never know what the Austin summer will bring plus I’d rather not feed my bees in fall or winter if I can help it. Both hives are also bringing in a lot of pollen. I’ll end this week’s post with a shot of something that represents the sound of summer in Austin. 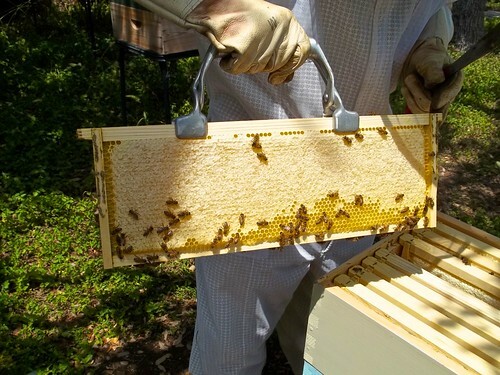 In my third year of beekeeping, I believe I have found the magic formula for an enjoyable honey harvest. Even though it has been near 100 degrees for the past few days, the bee escape did its job, and I had minimal bees in the supers for the harvest. 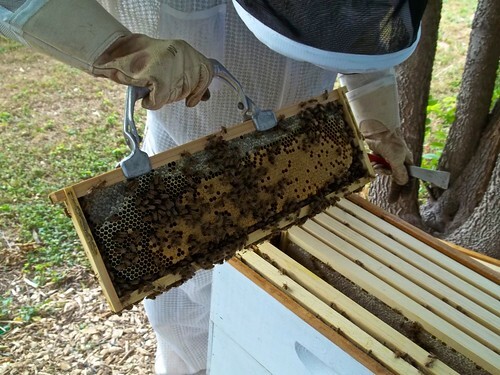 I was able to pull two full eight frame supers off my Baab-Brock Farm’s hives. 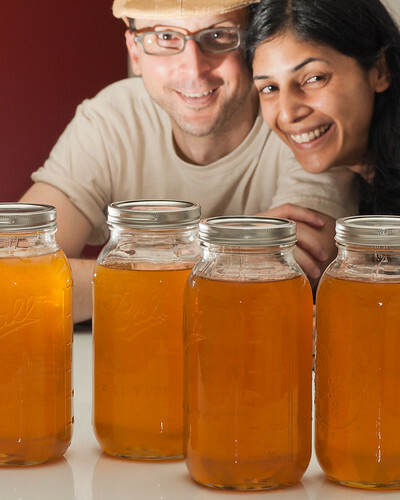 My spring time harvests have typically been a very light floral honey, and this harvest was no exception. 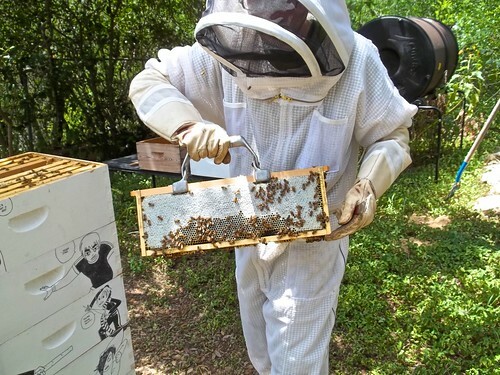 The bee escape does remove all the bees from the super so pests will try and take advantage of the situation. In my case, I had to deal with small hive beetles but there was no place for them to hide. 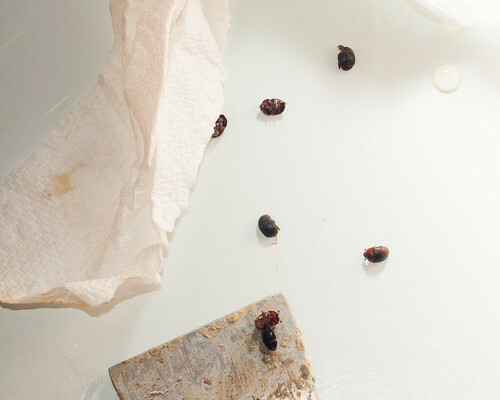 After the harvest, you do need to wait to let the honey separate from the wax if you are using the crush and strain method. 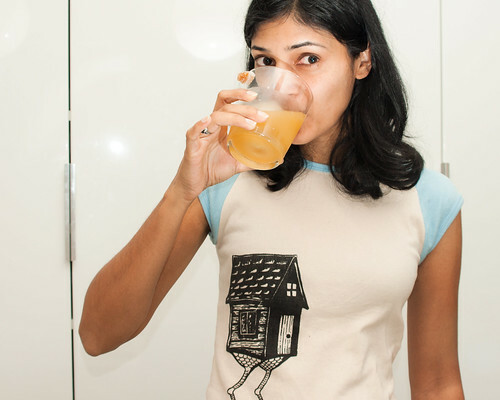 Brenna found a delicious cocktail recipe that uses both honey and scotch called the Penicillin, and it cures what ails you. We probably pulled close to 50 pounds of honey today. 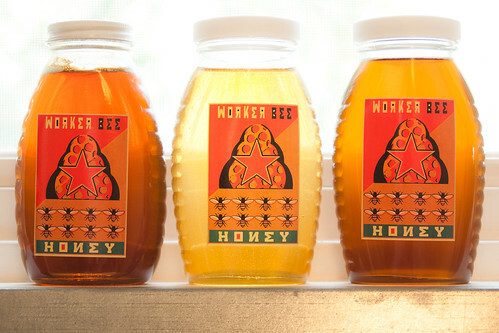 Here is a great shot that shows 3 seasons of Worker Bee Honey with today’s harvest in the middle. 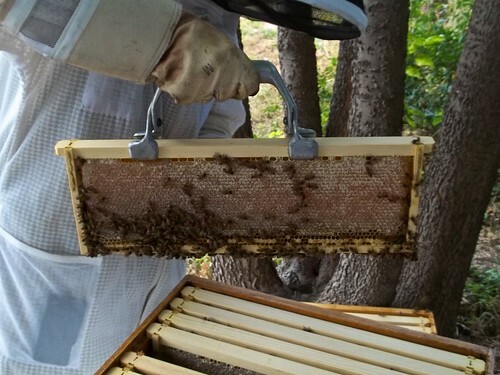 There is still a bunch of uncapped honey in both hives so I expect at least one more honey harvest before the Texas summer kills everything. I only hope we will get some good fall rains again this year so that our fall nectar flow is as good as our spring one. I’m convinced that Baab-Brock farms is ideally situated for creating massive honey producing machines. 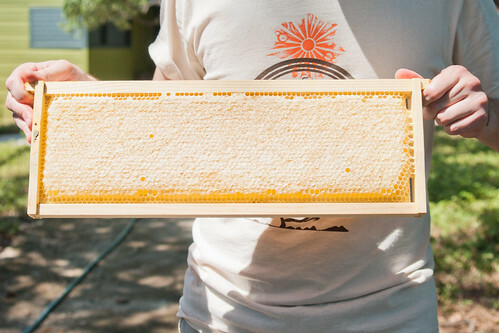 Even during the drought last year, the two hives I had were able to gather enough honey for their own winter stores. 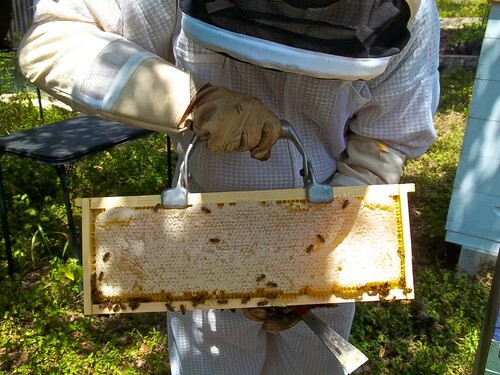 I always tell folks not to expect honey their first year as a beekeeper as a general rule of thumb. Rue has decided to break all those rules and pack away honey like it is going out of style. She has seriously filled up three supers worth of the stuff. Here’s a frame of honey. Oh look, here is another one. Not to be outdone, Knives 2.0 has refilled her honey super that I harvested less than 3 weeks ago. I’m planning on a massive honey harvest this upcoming weekend because these hives are about to be taller than I am. Rue is already at 6 supers, and I’ll need a ladder soon if she keeps on growing. I can’t believe this hive started in April. I caught my first tube today….sir. 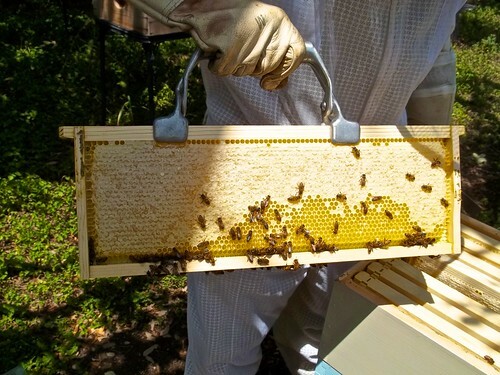 I’ve been in Florida for the past few weeks so I’ll be checking the hives today and posting updates. Until then, I’ll direct you all over to an entry on making surf wax at Baab-Brock Farms.